Redefining Ready! is a national initiative launched by AASA, The School Superintendents Association, to introduce new research-based metrics to more appropriately assess that students are college ready, career ready and life ready. The initiative is a response to dismal college and career readiness scores reported by standardized test makers that fail to portray a comprehensive picture of student potential. Learn more about the new college and career readiness indicators and join our national campaign to help school districts and systems across the nation continue Redefining Ready! 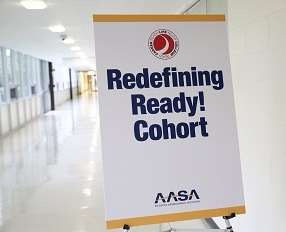 AASA is pleased to invite you to become a member of the 2019-20 Redefining Ready! Cohort. *The cohort will meet four times in-person with one of the meetings occurring as a breakfast meeting at the National Conference on Education in February 2020 in San Diego, California. The participation fee covers registration costs for the spring and fall 2019 meetings, the February 2020 breakfast meeting, and the spring 2020 meeting. AASA also provides reimbursement of up to $500 for hotel/travel for three meetings. (No reimbursement for the breakfast meeting at the National Conference on Education). Complete the following application to become a member. With questions contact the AASA program manager, Debbie Magee at DMagee@aasa.org. Why Join the Redefining Ready! Cohort?